ST GEORGE — The Utah State Commission on Stewardship of Public Lands voted to prepare a legal complaint against the federal government Wednesday, citing the findings of a legal team hired to examine the issue. The commission hired the Davillier Law Group, based out of New Orleans, to write the 145-page legal paper. The paper is the basis for plans to sue the federal government. After this analysis, the group recommended the state of Utah file a complaint. However, the Davillier Law Group also issued a caveat that a lawsuit would be expensive, time-consuming and was not guaranteed to succeed, since the federal government was likely to “vigorously oppose” the suit and would use every legal means to stop it. The group estimates that the total cost to bring a case against the federal government would be $13,819,000. The main argument in support of the lawsuit is that the federal government does not have the constitutional authority to permanently retain Utah lands. 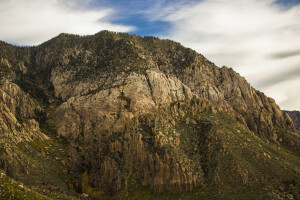 The document cites three legal theories that it believes gives Utah the right to claim the lands in question: Equal Sovereignty Principle, the Equal Footing Doctrine and the Compact Theory. The basis of the legal group’s argument is Utah is treated as a lesser member of the states of the union and has not been given the same rights as other states to have dominion over the lands within its borders. One of the lawyers on the team, Ronald Rotunda, a constitutional specialist, said the group felt it had a strong case. Nearly two-thirds of the land in Utah is federally owned and multiple issues regarding control of this land have been brought before legislators at both the state and federal level. So far, no lands have been turned over to the state. Southern Utah, like the rest of the Utah, is comprised of large swaths of federal lands, with national parks, monuments, forests and wilderness areas, among many other federal distinctions. The outcome of the lawsuit will have a direct effect on the region. Tom Butine, board president of Citizens for Dixie’s Future, said that Utah has no historical precedent to claiming land that was never the state’s property to begin with. Butine conceded the agencies in charge of federal lands were deserving of criticism, but there is a concerted effort on their part to improve. He also said a cause of the difficulty in making improvements on the part of those agencies was continually losing funding from Congress. Butine also said if the lands reverted to state ownership, the preservation of that property would suffer. Not everyone on the commission was supportive of the motion. Representative Joel Briscoe and Senator Jim Dabakis, the sole Democrats on the commission, both voted against the move. Commission Chair Sen. David P. Hinkins countered that the economic impact would be far greater if the state did not act, citing examples of extractive industries losing leases in the Uinta Basin. Sen. Dabakis said while he is not as worried about the $14-million figure specifically, he is concerned that the outcome of the lawsuit is highly doubtful, saying that scholars of law have called it a legal “hail Mary.” He also expressed his concern there is a pattern of secrecy and lack of inclusion by the chairs of the committee. Washington County Commissioner Alan Gardner said he is pleased with the report. Gardner disagreed with Butine’s assessment that there is no historical basis for turning the lands over to the state. “That was promised to us during our Enabling Act – that the lands would be disposed of,” Gardner said. Gardner said he felt the state would do a better job of managing the land. He pointed to federal regulations limiting access and use of those lands, saying the numerous rules make the land virtually unusable. “If the state has its way, we’re not bound by all those federal i’s that have to be dotted and t’s to be crossed to go ahead and manage like they need to be managed. We’ll be able to have better–managed forests, less fires and more productivity from our lands,” He said. Gardner also disputed Butine’s claim state control would lead to more development and less preservation. maybe the government figures utah will over develop it, like the saint george area and that way they save money in grants for pipelines because the city will make deals to sell water cheap to the ledges golf course. “Commission Chair Sen. David P. Hinkins countered that the economic impact would be far greater if the state did not act, citing examples of extractive industries losing leases in the Uinta Basin.” And, this is a bad thing? To many of us who cherish our public lands, this is exactly why we don’t want them coming to the state’s control. More extractive industry leases is not the future most Utahns want. As for, Commissioner Gardner’s comment, “That was promised to us during our Enabling Act – that the lands would be disposed of.” Commissioner, you should reread the Enabling Act in its entirety and quit cherry picking info. These are public lands, not federal lands. Perhaps if we made some effort to fund these federal agencies better they’d manage better. I doubt Utah state government could even come close. any further or other grants of land for any purpose than as expressly provided in this Act;” How does he possibly get a promise to dispose of all the public lands from that text? Chris, Commissioner Gardner is channeling the “actual intent” of the enabling act. It was impressed upon him during prayerful meditation and again while driving his pickup truck and listening to AM talk radio. Respect your leaders son. He is certainly “channeling” something from the act. It’s interesting that he is seeking something that no other state ever received–wholesale transfer of title from the federal government to the state government. In states like Nebraska, little if any federal land was retained because it was sold, homesteaded or otherwise transferred to PRIVATE INDIVIDUALS, but Gardner somehow reasons that what happened in those states means that the State of Utah should received title. I’m sensing some insubordination here Chris. Please schedule an interview with your bishop. Also, Washington County Republican Party leadership will need to speak with you. Please bring along a printout of your browser history and current temple recommend. Try as I will, but I just cannot find the words in the Enabling Act that Alan Gardner thinks is in it. I’ve read it many times. Wishful thinking on his part for sure. And the citizens of Utah will pay $14 million dollars on this folly? Write to your elected representatives and tell them what you think of this nonsense! LOL that’s your plan ? Write a letter to your elected representatives ? LOL ! Yeah that will get them in line ! Ha Ha Ha ! Should we send the letters postage due while were at it ? LOL ! I still believe that change can come when the people speak, either through contacting our representatives or voting them out. Of course it will take time, especially in Utah where one party has a hold on everything but I believe in change over time. I guess you could run for office. That would be helpful, too. I think there is a real opportunity here to stop this public land proposal. The $14 million dollar price tag is shocking and the people who are pushing this idea need to be hounded into explaining why we need it. There are many, many groups who can come together and stop this folly. It isn’t a Republican/Democrat issue. It is an issue that affects all of the public. Ask questions, demand answers. They don’t care what I think! 🙂 sue the feds and go to court for 10 years. Give the native Americans their land back, you know like it was before it was stolen from them. LOL ! it was never theirs in the first place ! They ain’t a gettin squat ! Utah has neither the financial resources nor the scientific resources to manage this land. What they do have is a collection of ranchers and developers who want to get their hands on it. Or their hooves, as the case may be. Why doesn’t Utah just secede from the Union and get it over with. These wrangles over the land in this state go on and on and on. Ridiculous. This is the 21st century, not 1848. Get out of the handcarts and try to keep up. Never been looked at before, my eye. This would have to go before SCOTUS, and the decision would be more about the timing and the Justices than any constitutional ‘theory’ (same as every other case of this sort and magnitude).